No other bottle remotely like this is recorded, but several features point towards Yangzhou as the place of manufacture and the workshop of Lu Dong as a possible specific site. On Lu Dong, see Sale 1, lot 76; Sale 2, lot 27; Sale 3, lot 30; and Sale 4, lot 23. High magnification suggests that the paler, cream-coloured fragments are bone, but other fragments appear to be black and brown lacquer. If it is by Lu Dong’s workshop, this would accord with his usual practice, which we have suggested involved grinding up whatever leftover offcuts remained from the process of embellishing and lacquering various wares, and mixing them with lacquer to create an aggregate effect, one that varied with the materials used. It would be a very ecological way to avoid waste, since the carving of segments for Lu’s popular embellished wares, which would have included ivory or bone, coconut shell, various types of lacquer, and a wealth of other materials, would have resulted in a mass of small fragments or shavings that were otherwise useless. A further possible link to Lu Dong is in the method of construction, with two apparently wooden sections joined vertically at the narrow sides. This is the standard for Lu’s wood-based snuff bottles, although, admittedly, that would be the logical standard for any snuff bottle with a wooden base that is to be covered overall with a layer of lacquer, as it avoids the more painstaking process of hollowing out a solid piece of wood. 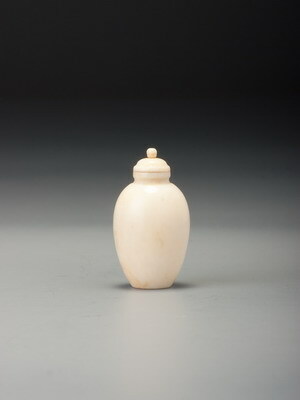 Whatever its origins, this is a unique and magnificent snuff bottle with considerable appeal. Similar workmanship and even a similar design are found on a box and cover on a black lacquer ground that is dated to the eighteenth century in Michael C. Hughes, LLC 2006, no. 48.